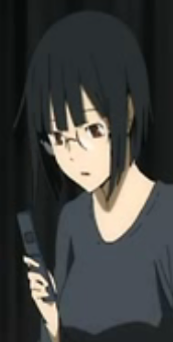 Celty thinks Anri's social media skills need improving. Mikado finds out that the Blue Squares are secretly still active, and rogue elements of the Dollars might have participated in the Slasher attacks, meanwhile Celty and the Slasher stage a raid on the Yellow Scarves stronghold in episode 19 of Durarara!!. Yes, misinformation is spreading faster, and one man in particular is positively ecstatic. Have these happy times come to an end? Anri joins the telecommunication revolution. As expected, the misunderstanding and secrets between the three friends is being actively manipulated by Izaya Orihara, who cleverly feeds nuggets of truth while omitting certain facts, or simply taking things out of context. 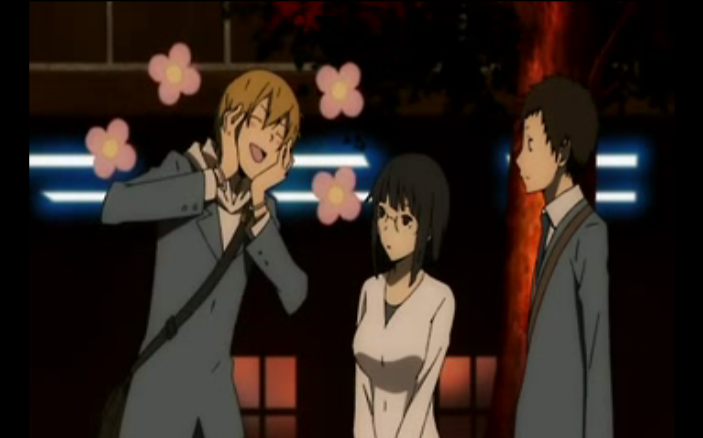 For example, Izaya feeds Mikado Ryugamine information about the Yellow Scarves without telling him that his best friend, Masaomi Kida is their leader. 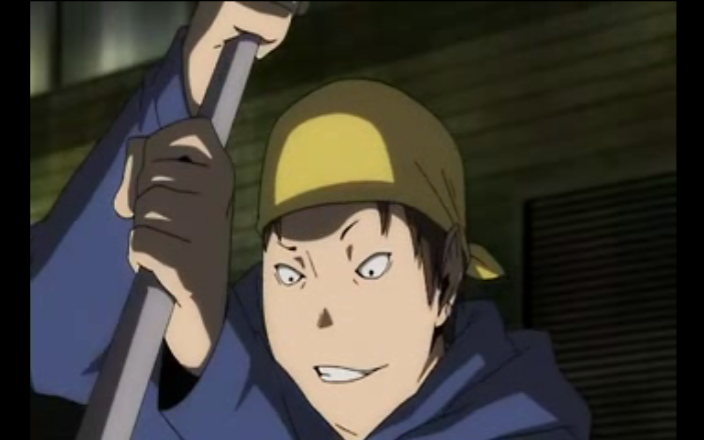 When Mikado says he is thinking of a way to get a message to the Yellow Scarves that the Dollars aren’t behind the Slasher attacks, Izaya suggests that members of the Blue Squares who have infiltrated the Yellow Scarves could be behind the attacks, in fact rogue elements within the Dollars could be behind the attacks. Now Izaya knows damned well what/who was behind the Slasher incidents. He operates by spreading information that is designed to mislead. 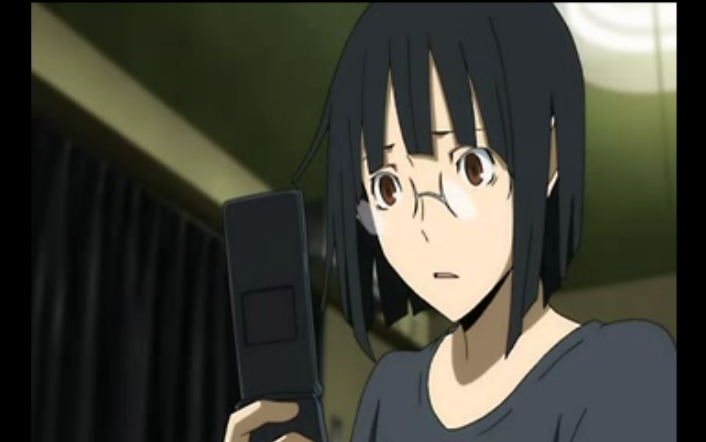 Split screen - Celty is watching out for Anri. 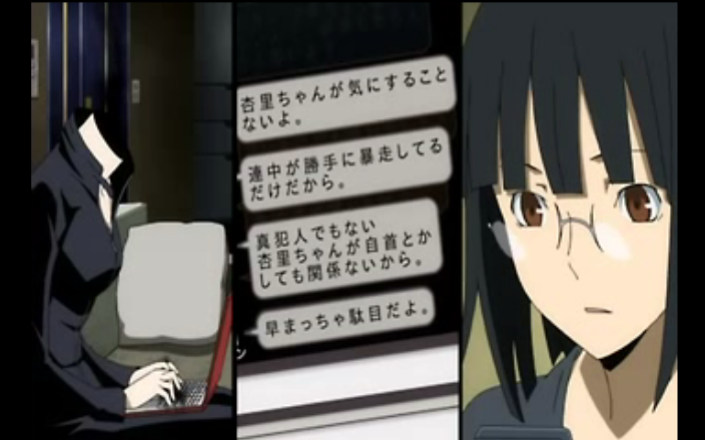 Similarly Izaya tries to feed Anri information designed to make her do something rash. Celty PMs Anri to calm her down (and warn her her against turning herself in to the Police). Amusingly, Anri doesn’t know how to send private messages, and sends her response to the whole chat room. 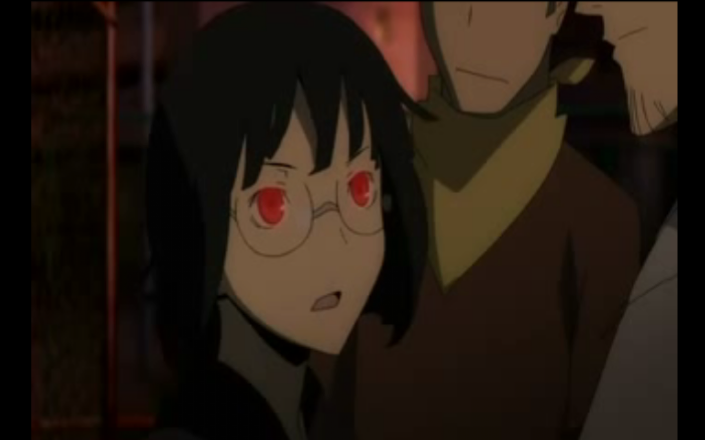 Fortunately Anri has other means of communication at her disposal. She goes into Saika mode, and gets her children to lead her to the Yellow Scarves stronghold. This brings us up to the cliffhanger from last week. The Yellow Scarves do seem like they are getting out of control, and have started attacking Dollars (or suspected Dollars members). When Celty shows up to save Anri from the Yellow Scarves, one of the Yellow Scarves hurls a pipe at Anri, who deflects it with her katana. The Yellow Scarves, including Masaomi, take this as confirmation that the Slasher is working with the Dollars, and that the presence there was an invasion of the Yellow Scarves headquarters, thus a veritable declaration of war. This seems to send Masaomi over the edge. Masaomi is not in a good mood. 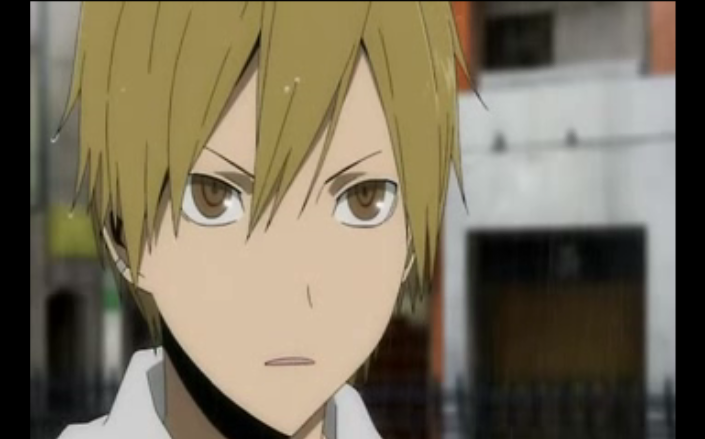 I think this episode of Durarara!! depicted the breakdown between the three factions realistically. Izaya played exactly the role you would expect. Distorting people’s perceptions, not so much by lying, but by misleading with partial truths. Anri’s fear of being discovered as a monster by Masaomi prevented her from confronting him openly when provided with the perfect opportunity. Mikado let his unwarranted faith in Izaya, and his own fears that the Dollars might be involved, get the better of him. Masaomi, wanting to stand up to protect his friends, is taking a course of action that could cause them real harm. This was a interesting episode seeing how things are being played out can’t wait for more, Anri looked cool on Celtys bike and the scene where they transformed the bike to a horse was great! side note Anri can text pretty fast xD and so had a 24 thought when i saw all the epic split screens. Yeah, the way they resolved that situation was cooler than what I thought might happen, that she would escape on her own. I actually wanted to include a screen cap of her texting frantically, but was afraid it was too dark to read out of context.